We worked closely with Grove Bedding as part of a large business strategy for retail. Having built a well-established network of retail stores, Grove Bedding had a loyal customer base and was performing well in their high-street retail outlets. 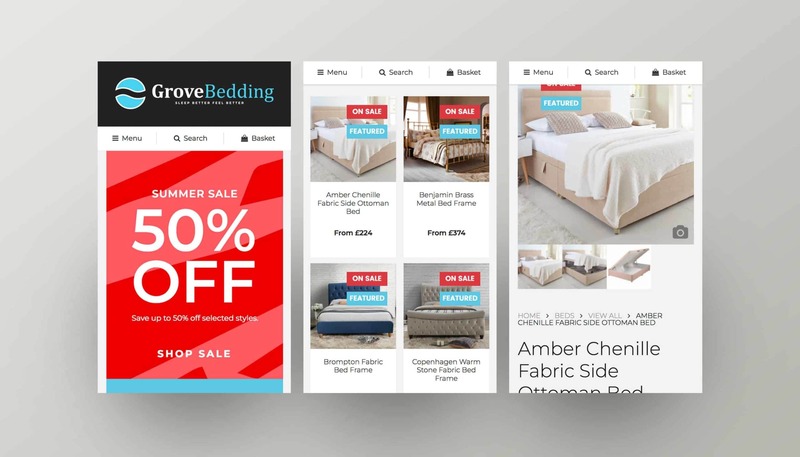 However, with shifts in consumer behaviour, Grove Bedding wanted to take this momentum and develop an e-commerce store to supplement their retail spaces. The aim was to attract a younger customer base who was used to shopping online, and reach a wider audience with an easy to navigate website. We spent a great deal of time working with Grove Bedding to ensure that the online retail space we created was in-keeping with their brand and their core values. We took time to understand Grove Bedding’s customer base and ensured that the design of the website reflected this. As they were trying to attract a younger audience, we incorporated live chat, visuals that represented all key-demographics, clean and sleek font and colour pallets whilst ensuring the site was simple to use and easy to navigate. As with all of our websites, the site was built from the ground up to ensure it worked seamlessly on mobile. 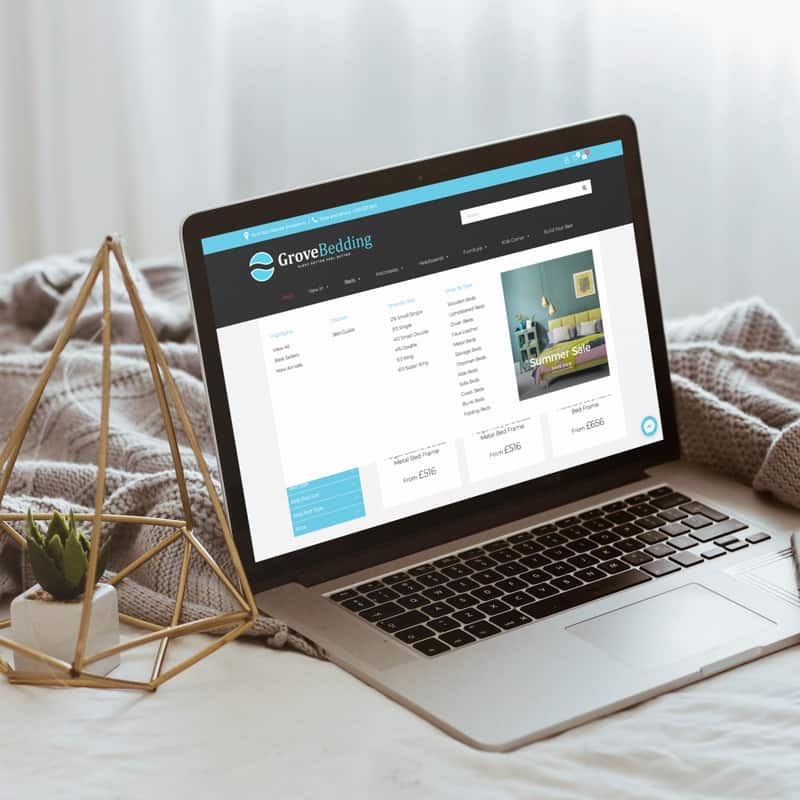 The new Grove Bedding website has provided an online retail space that has allowed for a wider customer base to reach the brand. The tagline, sleep better, feel better has been featured throughout the site and forms part of a wider marketing campaign that we are currently supporting Grove Bedding with. “Hype worked extensively with us in developing our new website. As an established local business, we have built a solid customer base, but to move forward digitally, we needed to reach a younger audience. Hype built our website from the ground up, increasing our online presence and achieving our target of appealing to a new demographic. The communication was excellent from beginning to end and they even discussed post launch strategy and ideas with us. They are forward thinking in terms of overall online and offline strategy and provided support and guidance in ensuring we were GDPR compliant. They have an honest, trustworthy and knowledgeable working style, by always meeting deadlines, providing realistic expectations and being frank with evolving ideas to help us rebrand successfully. Hype also went above and beyond by visiting store locations and discussing how we can ensure our physical retail showrooms and our website are consistent in terms of brand voice and design.